In Germany, you need to go through a recognition procedure for certain job categories which are regulated by law. Here's what you need to know in order to get your qualifications recognized so that you can start work. In Germany, there are regulated and non-regulated professions. For the regulated jobs, you will need to follow a recognition process for your qualifications. For instance a physician, a nurse or a teacher belong to regulated professions. For non-regulated jobs it helps to have your qualifications evaluated. That will increase your chances on the job market. Generally, anyone can request a recognition process, regardless of residence status or nationality. In Germany, there are jobs that are regulated by state law and ones that are regulated by federal law. The job of a professional baker for example, is federally regulated. There are 330 qualified professions catered for by the German vocational and educational system, also known as the 'dual system'. This is a combination of theory and on the job training in real-life work environments. These programs are federally regulated. The job of a teacher, architect or an engineer, on the other hand, is regulated by the states. 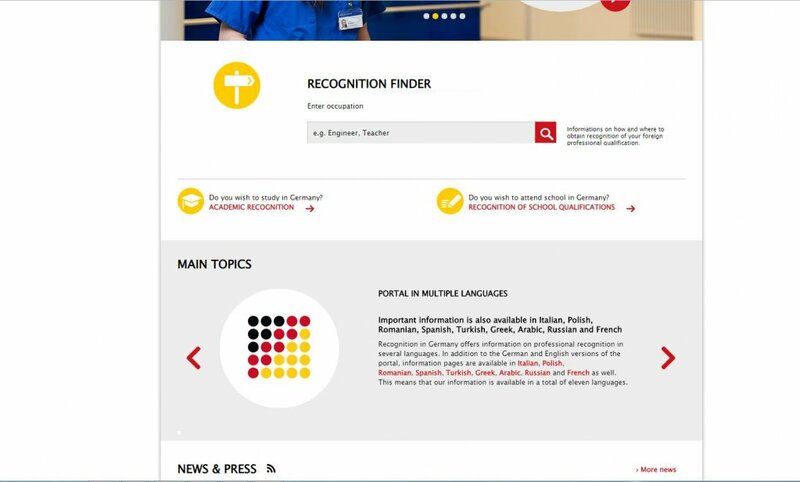 You can find out if your profession needs recognition by visiting the multilingual website “Recognition in Germany”. The site then tells you via the "Recognition Finder" if the profession is regulated or non-regulated and which office is in charge of the recognition procedure. Type in the search field your profession and your zip code. Then the recognition finder will show you the office in charge, to which you can send your application and documents. Full recognition: That means your qualifications are equivalent to the German reference profession. Partial recognition: You have to complete adjustment qualifications in order to compensate the differences. No recognition: The disparities between your qualifications and those of the German profession are too big. According to the Federal Ministry of Education and Research, from 2012 to 2015, more than 40,000 qualifications gained abroad were recognized as being equivalent. 1,900 applications were denied. 75 percent of Syrians, 62 percent of Iranians and 56 percent of Afghans who applied for a recognition process have received full equivalence. The procedures are usually subject to charges. The total charged depends on the rules of the office itself and the respective expenditure. Currently, the fees are between €25 and €1,000. If you get a rejection notice, the costs will be between €100 and €200. No paper or lost documents? You can request a skills-analysis assessment if you have lost your papers and/or your documents are incomplete. By passing this, you would have the possibility of proving your competence in your profession. There are two options for skills analysis: You can either request to work on a trial basis in your field for a short period of time to show what you can do, or you will be interviewed by experts in your field about your competencies, knowledge and expertise. The skills analysis assessement thus provides practical evidence of your qualification. It's not an exam in the classical sense. It offers you and your employer an ideal way of assessing your professional competencies. But what about university degrees which don't lead to regulated jobs? For example if you have studied humanities, social sciences or chemistry. For that, the "Zentralstelle für ausländisches Bildungswesen" (Central Office for Foreign Education) can help. The ZAB is responsible for the assessment of foreign higher education qualifications and evaluates academic degrees. The center issues "Statements of Comparability" which is an official document that describes the foreign higher education qualification and its professional and academic usage. It can facilitate access to the German labor market. It is a comparative assessment but not a recognition certificate. Statements of Comparability cannot be issued for school certificates. There are a number of different authorities responsible for the recognition of foreign professional qualifications. These authorities may ask the ZAB for expert assessment in individual cases or for general information about a country and its educational system. The information centers “Integration through Qualification” offer consultation in person, over the phone or via email. There are over 100 information centers in Germany. The consultations are free of charge.